With millions of subscriber nationwide, Talk N Text (TNT) user are frequently finding ways to save some cash, instead of paying 1 peso per text and 7 pesos per minute call. I will share a consolidated list of Talk N Text (TNT) promo for the year 2013 and save some money. UnliTxt2ALL20: For only Php 20, you can send UNLIMITED text to ALL networks for 2 days! To register, text UA20 to 4545. GaanTxt10: For only Php 10, you can send 100 SMS or MMS to TNT and Smart subscribers plus 10 SMS to ALL networks. Promo is valid for 1 day. To register text GT10 to 8855. GaanTxt20: For only Php 20, you can send 200 texts to ALL networks valid for 2 days. To register, text GT20 to 4545. UnliTxt10: For only Php 10, you can send unlimited text to TNT or Smart in 1 day! To register, text U10 to 4545. SangkatuTex15: For only Php 10, you can send 200 texts to TNT or Smart for 2 days. To register, text STEX15 to 4545. SangkatuTex60: For only Php 60, you can send 1o00 texts to TNT or Smart for 7 days. To register, text STEX60 to 4545. UnliTxt150: For only Php 150, you can send unlimited text to TNT or Smart with 30-day validity. To register, text U150 to 4545. UnliTxt300: For only Php 300, you can send unlimited text to ALL network with 30-day validity. To register, text U300 to 4545. SangkatuTok15: For only Php 15, you can make 20 minutes call to TNT and Smart. Valid for 2 days. To register, send STOK15 to 4545. SangkatuTok30: For only Php 30, you can make 45 minutes call to TNT and Smart. Valid for 4 days. To register, send STOK30 to 4545. UnliTxt Extra30: Avail of 3 days unlimited text to TNT or Smart plus 15 minutes call to TNT or Smart for only Php 30. Send U30 to 4545 valid for 2 days. UnliTalk Plus 20: Avail of unlimited calls to TNT or Smart from 10:00 PM to 5:00 PM plus unlimited text whole day to TNT/Smart. Promo costs Php 20 valid for 1 day. Send T20 to 4547. Gaan All-in-One-15: Enjoy 150 text to ALL networks plus 15 minutes call to TNT or Smart valid for 1 day for Php 15. To register, send GA15 to 4545. Gaan All-in-One-20: Enjoy 200 texts to ALL networks plus 20 minutes call to TNT or Smart valid for 1 day for Php 20. To register, send GA20 to 4545. Gaan All-in-One-30: Enjoy 300 texts to ALL networks plus 30 minutes call to TNT or Smart valid for 2 days for Php 30. To register, send GA30 to 4545. Gaan All-in-One-55: Enjoy 550 texts to ALL networks plus 55 minutes call to TNT or Smart valid for 3 days for Php 55. To register, send GA55 to 4545. Gaan UnliTXT Plus 15: Get unlimited text to TNT and Smart plus 15 minutes call to TNT or Smart for only Php15. To register, send GU15 to 4545. Promo is valid for 1 day. Patok-O-Tex-15: Avail of Php 0.50 call and text rates to TNT and Smart when you register to this promo. Pay only Php 15, valid for 1 day. To register, text TOT15 to 4545. 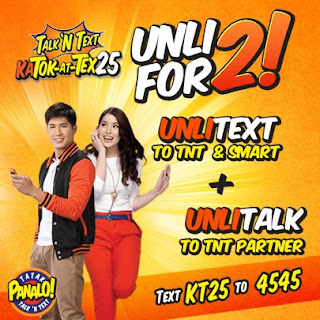 Patok-O-Tex-20: Avail of Php 0.50 call and text rates to TNT and Smart when you register to this promo. Pay only Php 20, valid for 1 day. To register, text TOT20 to 4545. Patok-O-Tex-30: Avail of Php 0.50 call and text rates to TNT and Smart when you register to this promo. Pay only Php 30, valid for 2 days. To register, text TOT30 to 4545. What are you waiting for? Use these codes to avail the promo. And please do share with us if its still working so that I can update the list. Do you like our work, then subscribe using the box below to get daily updates. wala po bang unli call and text good for 1 month? wala po eh, mag plan nalang po kayo. Try nyo po, pero wala naman nilagay na available lang on selected areas. Minsan akala mo wala, kasi sa dami ng nag reregister medyo nahihirapan cguro system nila. UNLI CALL FOR TALK AND TEXT? Meron po bang Unli Call to ALL NET & Unli Text ? U20 to 3545. Unlitext to smart/tnt for 3 days. Pero kapag zinero balance nyo magiging unlitxt xa to all networks 3 days. If magreload kayo hindi mababawasan load nyo.if magreload kau wul still registered to the promo wag kau magtxt 2 ader networks.dapat zero balance kau. is there any promo about 1month and txt ?